You can tell an awful lot about people and what they were thinking — what they believed, what they aspired to — by reading the laws of the time. That’s the one thing The Legal Genealogist really hopes every genealogist eventually comes to understand: that we read the laws not just to get the answers to specific genealogical questions about our families, but to get the flavor of the places where and the times when our families lived. Now think about that… and think about what that tells you about those farmers and artisans of the late 1700s. Think about the mindset it reflects — the attitudes and work ethic it incorporates. And whether our particular family was among those farmers and artisans — or we descend from one of the vagabonds or rogues of the day — this reflection of the time in the laws of the time is part of our family history. So I guess UNcommon pipers, drunkards, night walkers, railers or brawlers were OK? It is amazing sometimes to see just how laws are worded! I love reading your law excerpts. Sometimes they are really enlightening, and sometimes they are also hilarious! I have run across mentions of my 3rd great-grandfather Micajah and his brother (or cousin) Carlton being taken to court for “trespass” in North Carolina around 1800. I need to find out just what that might have meant at that time and place. Carlton’s father (or uncle) lost some land he had pledged to ensure that Carlton would show up in court in one case, so I’m assuming it was a fairly serious offense. Don’t be too quick to think that “trespass” meant a criminal act. That’s what we think today, but… that’s not how it was usually used in the past. See the posts No jail for James and Unforgiven trespass. In Alabama we had an interesting type of rogue called liners – people who settled on county boundaries to frustrate county officials in their duties. Many private laws in Alabama deal with the problems they caused as well as others who ended up on a county line by accident because of the frequent boundary moves. The Old Federal Road was a long boundary between Monroe and Conecuh counties. People had land and relations on both sides of the road in both counties. It matters here as Monroe county has records 1815-1819 and 1833- while Conecuh records for 1818-1866 were destroyed in a courthouse fire. Over the last four months, I have been studying early American Republic history. One book that we talked about and loved in the symposium was Scraping By: Wage Labor, Slavery, and Survival in Early Baltimore. Much like those folks up in New Hampshire there were almshouse, workhouses, and laws regulating the poor. My focus in research in Baltimore is not the poor, but elite who managed to migrate, and through familial ties network into a trade: peddling. I am writing and researching about early Jews in Maryland. My familial ties are in New Hampshire and New England. My ascendants were those that set up the workhouses and laws. For me, the ordinary and scraping by people show American character. Just how did they survive? And how many rags to riches stories do we have to tell? Legal history is a great anchor to discover the struggles of our early famiiles. Legal history is a great anchor to discover the struggles of our early families. 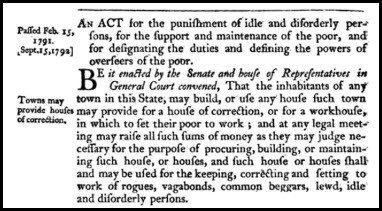 In 1758, your distant cousin Peter Pettypool fell afoul of the Virginia version of these statutes and was arrested twice in one day for his infractions, thereby setting a record for arrest which so far as I know still stands in the family. Gotta love our Pettypools! Thanks, Jim! Who would decide if someone misspent what they earned? I’m sure the bar keep and UNcommon street walkers would have a different view than the church. It would have been a decision by the courts of the day.